I am scheduled for a hair transplant in 3 weeks, but I am going on vacation shortly after. Do I have to wear a hat every time I go outside? Also, my friend was really red after his procedure, was this due to sun exposure? Sun exposure may inhibit the healing process of the hair transplant for several different reasons. Generally, redness in the hair transplant recipient area occurs due to tiny micro-incisions that are created to place follicular unit grafts in to balding/thinning areas. Unfortunately, some patients may believe that redness occurs from sun exposure which is generally not the case unless there was sun-exposure for a prolonged period of time. It is normal for skin to become red while healing from surgical trauma. In general, patients with a darker skin complexion recover faster than fair skinned patients. Most hair transplant surgeons recommend that patients wear hats and use sun block when exposing themselves to powerful ultra violet (UV) rays for the first 4 months. Moreover, scalp redness is typically indicative of some minor inflammation of the skin, which is normal after a hair restoration procedure however, patients who suffer UV ray overexposure or are sunburned should contact their hair restoration physician immediately for follow-up care. 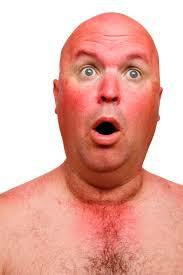 It is critical patients limit how often they expose their scalp (recipient site) to the sun. This is because strong UV ray exposure can penetrate the epidermis (skin surface layer) and damage hair follicles that have not yet healed. It is recommended to limit sun exposure for the first 4 months. During this time, patients are advised to wear hats or use sunscreen of SPF30 and above. Does Caffeine Stop Hair Loss? Can Future Hair Loss Be Predicted?